A collection of rumors and conspiracy theories associated with the Boston Marathon bombing. The two individuals believed to be responsible for the Boston Marathon bombings have been positively identified as Tamerlan Tsarnaev, now deceased, and Dzhokar Tsarnaev, now in custody. These individuals are brothers and residents of Massachusetts. Tamerlan Tsarnaev was a legal permanent resident and Dzhokar Tsarnaev is a naturalized U.S. citizen. Once the FBI learned the identities of the two brothers, the FBI reviewed its records and determined that in early 2011, a foreign government asked the FBI for information about Tamerlan Tsarnaev. The request stated that it was based on information that he was a follower of radical Islam and a strong believer, and that he had changed drastically since 2010 as he prepared to leave the United States for travel to the country’s region to join unspecified underground groups. One rumor posited the irony that the Boston Marathon bombing suspects, brothers Tamerlan and Dzhokar Tsarnaev (originally from the Russian republic of Kyrgyzstan or Chechnya) had become naturalized citizens of the U.S. on September 11, the anniversary of the 2001 terrorist attacks on the World Trade Center and Pentagon. According to news accounts, Dzhokar came to America on 1 July 2002 as a tourist, asked for asylum, and was naturalized as a U.S. citizen on 11 September 2012. However, his older brother Tamerlan came to the U.S. later; although Tamerlan eventually acquired permanent residency status, he did not obtain U.S. citizenship. Over the night of April 18-19, the two suspects in the Boston Marathon bombings, Tamerlan and Dzhokar Tsarnaev, reportedly fatally shot an MIT police officer in Cambridge, carjacked a Mercedes SUV, led police on a car chase into Watertown, and engaged in a firefight that ended with Tamerlan being shot dead. His younger brother Dzhokar eventually abandoned the stolen vehicle and fled on foot; he was captured that evening after being discovered hiding in a boat parked behind a house. However, although the Westboro Baptist Church had said they planned to picket the funeral of Sandy Hook principal Dawn Hochsprung, motorcyclists lined up at the site of the service that day to confront the WBC’s protesters, and the latter never did materialize. Supporters of the Boston Marathon victims are hoping the WBC will be no-shows at the funerals of those killed in that tragedy as well. According to news accounts, the former picture was included in a security bulletin issued to law enforcement agencies by the FBI and shows a shredded backpack in which one of the bombs was hidden. 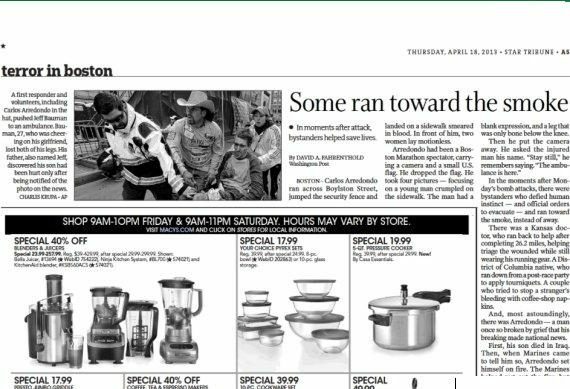 The latter picture was not one that was distributed by police for help in locating a suspect; rather, it is the product of various individuals on the Internet scouring photos of the Boston Marathon scene for clues and circulating their speculations online. .
On Thursday, 18 April 2013, the FBI released photographs of two suspects they were seeking additional information about, neither of whom was the man pictured above. On 19 April, one of the suspects was killed in a shootout with police, and the second was apprehended later that same day in Watertown, Massachusetts. As occurred after the Sandy Hook shooting, conspiracy proponents claimed that a number of the Facebook Boston Marathon bombing-related pages of the type which inevitably spring up in the aftermath of such tragedies (e.g., memorials, tributes, condolences, and donation sites for victims) bear dates indicating they were created earlier than the occurrence of the events they reference, thus exposing those tragedies as “false flag” events planned and coordinated by some sinister force (usually said to be the government) intent on deflecting blame away from the “real” perpetrators. After the Boston Marathon bombing, one page titled “Our thoughts and prayers go out to all involved in the Boston bombings” was flagged as such because it was allegedly created several hours prior to the bombings, and another (since removed) page with the title “Thoughts go out to all involved in the Boston explosions” was similarly identified as suspicious because it bore a “Joined Facebook” date of Saturday, April 13 (two days before the bombings it references). Likewise, “Joined Facebook” dates by themselves do not provide reliable timelines documenting the creation dates of Facebook pages. Facebook page names can be changed, and pages which were initially created prior to particular events for other reasons and then renamed/repurposed after those events retain their original pre-tragedy dates. So, an unused Facebook page created in March 2013 can be quickly renamed to serve as a memorial for victims who died in an April 2013 bombing, but the “Joined Facebook” date will reflect the earlier (March 2013) date. The boy was killed and his mother and his younger sister gravely wounded as they waited at the Boylston Street finish line. 3rd Annual Joe Cassella 5K) run in Virginia back in May 2012. This is Martin, 8. He died in the Boston bombing yesterday. He was at the finish line with his family, waiting for his dad to cross. His mother and little sister were catastrophically injured. He was the student of our dear friend, Rachel Moo. His message resonates powerfully today. My prayer is that we all live by Martin’s words, paying tribute to his too-brief, but immeasurably valuable life by following his example. This is indeed a picture of Martin Richard, taken in April 2012 during a classroom lesson on the shooting of Trayvon Martin. A photo gallery published by the New York Post includes this image along with other photographs of Martin Richard and pictures of well-wishers visiting the Richard’s home to leave messages, flowers, and other tokens of support. The man in the red shirt planned to propose to his girlfriend as she crossed the finish line at the Boston Marathon, but she passed away. Most of us will never experience this amount of emotional pain. Occurrences like this remind us how fragile life is and how important each person is to so many people. My heart goes out to all of the people affected. Shrapnel from one of the bombs that exploded during the Boston Marathon shredded both of Sydney’s legs, leaving her with deep arterial injuries, said her older brother, Tyler Corcoran, during an interview in the kitchen of the family’s home in the city’s Pawtucketville neighborhood.Sydney, with her mother, Celeste, and father Kevin, were in Boston to watch her aunt, Carmen Accabo, of Westford, finish the storied event. Celeste, too, was struck by shrapnel and overnight had both legs amputated below the knee, Tyler said. Kevin received minor injuries, but otherwise was physically okay. He was at the Boston Medical Center bedsides of both his wife and daughter Tuesday, said his brother, Tim Corcoran, of Rhode Island. The picture [of her being aided by a stranger] in a red t-shirt was so touching that it sparked a false rumor on Twitter that he was proposing to his dying girlfriend. This tweet was proffered by conspiracy theorists as proof that officials planned for a “controlled explosion” to be under way at the same time as the marathon explosions, a highly suspect “coincidence” that indicated the bombings were “false flag” operation. However, this tweet was issued about an hour after the bomb blasts and referenced a controlled detonation of a suspicious device near the central branch of the Boston Public Library, which is on the stretch of Boylston Street where the initial explosions occurred. A fire and possible explosion Monday afternoon at the JFK Presidential Library and Museum prompted a full-scale investigation by local, state, and federal authorities to determine whether the incidents were linked to the deadly Boston Marathon blasts.The fire broke out shortly before 3 p.m. — around the same time as the Marathon explosions several miles away — in an HVAC system in a section of the complex opened in 2011 that houses offices, a classroom, and some archival material, said Rachel Flor, a library spokeswoman. Everyone evacuated the building in Dorchester safely and no injuries were reported, she said. “Can everyone pray for my son Jeff Jr.?” Jeff Bauman Sr. wrote in an emotional plea on his Facebook page hours after the bombings at the Boston Marathon.The elder Bauman, of Chelmsford, posted that message under a news photo of his critically injured son being rushed from the scene, after two explosions near the finish line killed three and injured more than 140. Bauman, who could not be reached for comment, wrote that his son was at the finish line when he was injured by one of the blasts. His son was transported to a hospital where he was undergoing surgery on his legs. From his hospital room, Jeff Bauman Jr. provided the FBI with a description of a man whom he saw drop a bag near the finish line of the Boston Marathon, information which may have helped law enforcement identify one of the suspects. Whoa! Government is slipping up! This lady supposedly died in the elementary school shooting & apparently died again in the bombing at Boston. They have to be smarter than this, right? The woman pictured above is the late Dawn Lafferty Hochsprung, the school principal who was killed in the Sandy Hook shootings, and the right-hand panel purportedly shows her picture being displayed on the screen during an interview with someone named Donna about the Boston Marathon bombings. Some commentators have noted that the woman who stepped in as principal at Sandy Hook after Dawn Hochsprung’s death was Donna Page and theorized that the former was the “Donna” referenced during the pictured interview about the Boston Marathon bombings (in the course of which her predecessor’s picture was shown on-screen). Although at least one woman named Donna who ran in the marathon that day did give media interviews about her experience, the only such reference we have seen that mentioned a surname identified the interviewee as Donna Bruce, not Donna Page. A group of Newtown parents known as Team Newtown Strong entered the Boston Marathon and ran the 26 miles to honor the 26 victims of the Sandy Hook shootings, so it’s possible Dawn Hochsprung would have been mentioned if one or more of those team members had been interviewed. No evidence yet suggests there is any reason to connect the person atop a nearby building with either of the explosions, as there are plenty of innocuous reasons why someone might have been in that location at the time. Police took a 20-year-old Saudi national into custody near the scene of the horrific Boston Marathon bomb attack, law-enforcement sources said.The potential suspect was questioned by the FBI and local police at Boston’s Brigham and Women’s Hospital, where he was under heavy guard while being treated for shrapnel injuries to his leg sustained in the blast. In late afternoon, a large group of federal and state law enforcement agents raided an apartment in a building in the Saudi man’s hometown of Revere, Mass. FBI agents could be seen through one window. It was not clear what, if anything, they found. But Revere fire officials said they were called out to support bomb-squad officers as part of an investigation of a “person of interest” in the marathon attack. At the hospital, investigators seized the man’s clothes to examine whether they held any evidence that he was behind the attack. The law-enforcement sources also said that the man was not free to leave the medical center. He didn’t do it.The Saudi national questioned in the aftermath of the Boston Marathon terror blasts that killed three is considered a witness rather than a suspect, sources said. Abdul Rahman Ali Alharbi, 22, remained hospitalized in Boston as investigators searched every inch of his Revere, Mass., apartment and grilled his roommate. line of the event that draws runners from around the globe. Alharbi’s Facebook page indicated that he was in the United States on a scholarship to study at the New England School of English. He reportedly held a student visa. A school classmate echoed Bada, describing Alharbi as a low-key guy who never showed any inkling of anti-American sentiment. A few days after the bombings, a rumor began to circulate that the U.S. would be deporting Alharbi back to Saudi Arabia the following week on “security and related grounds.” Since then contradictory reports have claimed that he is being deported, that he is not being deported, and that the U.S. government was planning to deport him but is now reconsidering the move (or has decided against it). This picture was taken from CCTV surveillance footage outside a chemical distributor storage warehouse (located 15 miles away from the place of explosion — closest chemical warehouse near the Boston marathon). According to the employees who are employed in the warehouse, the man had asked for a chemical present in a pentane-air mixture. This type of chemical could be bonded with other chemicals such as the nitric oxide gas, which could cause a massive combustion. Although he was denied the purchase of the chemical (alternative methods of creating explosives are available), there is a high chance that he is responsible or knows something about the bombings. If everyone could please like or share this picture and page, we may be able to find out the responsible people behind this wicked crime. This picture has absolutely nothing to do with the Boston Marathon bombings. 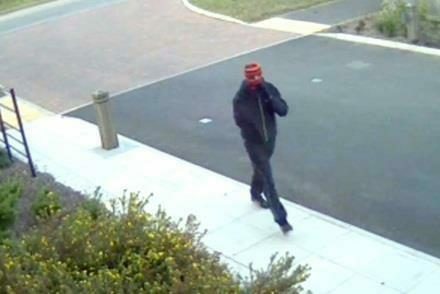 It originated with CCTV footage taken back in August 2011 and shows one of three men who were observed leaving a building where a burglary took place in Oakham, the county town of Rutland, East Midlands, England. One of the more tasteless hoaxes making the rounds in the wake of the bombing at the Boston Marathon revolves around a recent episode of Fox’s Family Guy.”Turban Cowboy,” which premiered in the U.S. on March 17, culminates with a scene depicting Peter Griffin accidentally blowing up a bridge by dialing a terrorist’s cell phone. But in the video making the rounds online, the cell phone scene is placed immediately after an unrelated moment in the episode when Bob Costas, voicing himself, asks Peter how he won the Boston Marathon. Aside from the confusion prompted in people unaware that the clip is a hoax, it’s drawn criticism from those involved with the show. “The edited Family Guy clip currently circulating is abhorrent. The event was a crime and a tragedy, and my thoughts are with the victims,” show creator Seth Macfarlane tweeted. The Boston Globe. 16 April 2013. New York Post. 16 April 2013. [New York] Daily News. 16 April 2013. The Blaze. 18 April 2013. Military Times. 5 November 2012. The Lowell Sun. 16 April 2013. The Boston Globe. 15 April 2013. WBZ-TV [Boston]. 16 April 2013.